Manag Marsangdi Club, Nepal has also secured its berth in the semi-final round of the ongoing 38th All India Governor’s Gold Cup International Football Tournament 2018 here at Paljor Stadium. In the well contested last quarter-final match on Tuesday, MMC outplayed Calcutta Customs 4-2 to progress into the semi-final round of the tournament. Local favourite, Nepal team has received a good local crowd support throughout the match. With an attacking start, Bimal Rana scored the early lead for MMC in the 12thminute. 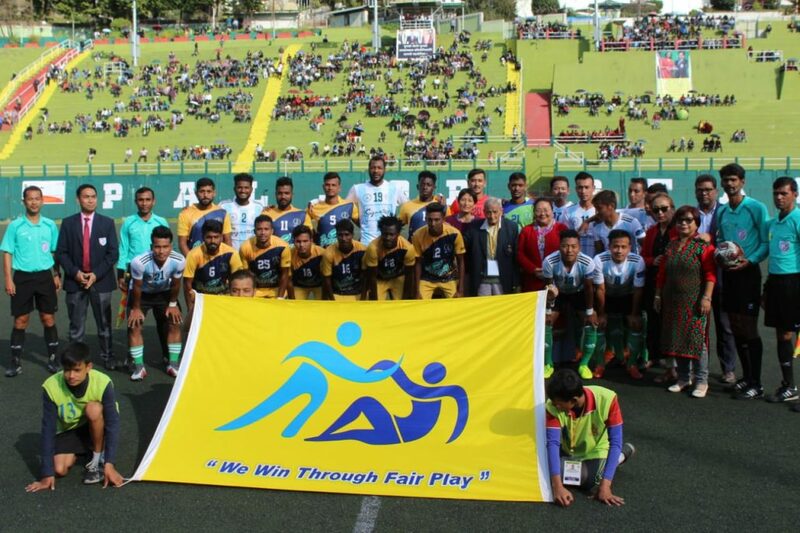 However, MMC could not able to hold the lead for longer when its defender, Muhammad Asif mistakenly netted their own goal in the 28thminute while trying to kick the ball away from the goalpost. Calcutta Customs also maintained a good pressure on Nepal side but missed many chances to net the goal. Finally, the first half ended in a 1-1 draw. Players of both team played neck-to-neck again in the second half but missed some good opportunities to take the lead in the early minutes of the second half. Bimal Rana completed his brace in the 65thminute to take the lead of MMC to 2-1 but soon Rakesh Dhara has scored the beautiful equaliser for Calcutta Customs in the 72ndminute. When both teams were playing their hearts out to take the lead in the match, Sujal Shrestha extended the lead of MMC to 3-2 in the 84thminute and his brace in four minutes injury time has sealed 4-2 victory of MMC, Nepal. MMC Nepal will now take on ISL team, ATK Kolkata [Reserve] in the second semi-final match of the tournament on November 1. On Wednesday, the first semi-final match will be played between home team, Sikkim Aakraman Football Club and Army (Red) at 2 PM.